Sanctions have had a limited effect on the Russian population whose support towards the government’s Ukrainian policy does not seem to be eroding. Russia’s economy is not in meltdown, but it has been suffering from sanctions and falling oil prices. The MICEX Index has been declining (more than 7% over a one-year period), and the rouble has significantly dropped versus the dollar (more than 20% this year). Foreign direct investment flows are expected to drop by 50% according to the Vienna-based Institute for International Economic Studies. According to the IMF, Russia’s economic growth forecast is also looking weak, thanks to sanctions and undermined investor confidence due to geopolitical turmoil in Ukraine. The effect of the sanctions coupled with record low oil prices might be visible on a macro-economic level, but it has not yet altered the Kremlin’s aggressive policy in Ukraine. One explanation is that sanctions have had a limited effect on the general Russian population whose support towards the government’s Ukrainian policy does not seem to be eroding. Russia’s president, who over the past few months has been enjoying a record high approval rating of more than 80%, has public support for Moscow’s involvement in eastern Ukraine. According to the opinion poll results published on 16 October by Levada, the independent research centre, more than two-thirds of surveyed respondents (68%) oppose stopping support to pro-Russia rebels in eastern Ukraine. 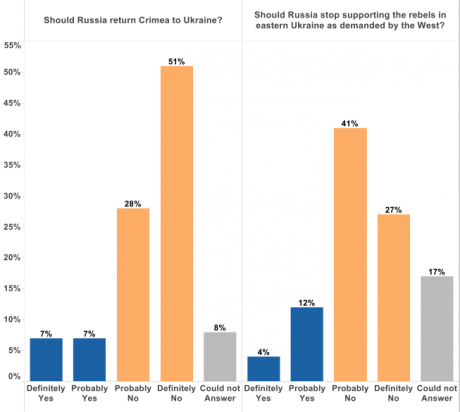 Even a larger percentage (79%) is against returning Crimea to Ukraine. Such public backing of Russia’s meddling in Ukraine can be largely attributed to the fact that the Western sanctions are either failing to exert sufficient pressure or need more time to take full effect. Whatever the explanation, the fact is that the general Russian population is as yet largely unaffected by the sanctions. According to the same Levada poll, for a vast majority (79%) of the surveyed respondents, sanctions have not caused tangible problems. 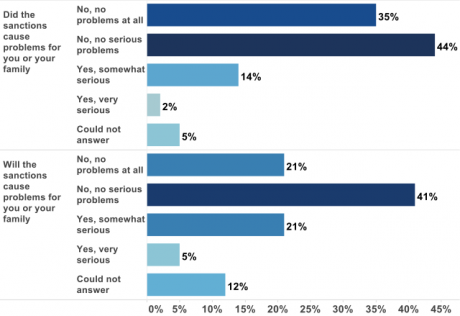 Furthermore, almost two thirds of the respondents do not anticipate major problems in the future. Western sanctions are either failing to exert sufficient pressure or need more time to take full effect. Even though it seems that a majority of Russian citizens is not much troubled by the sanctions, more people tend to see them as targeted against the whole country rather than Russia’s leadership, which is directly responsible for the actions in Ukraine. 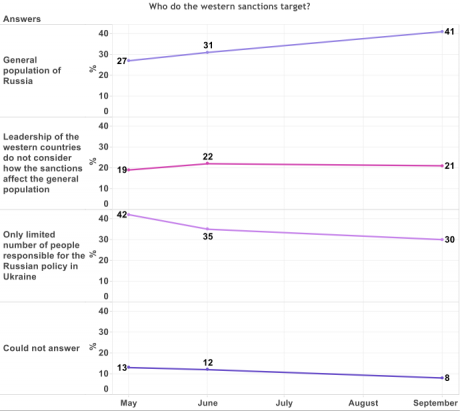 When asked in May by Levada, at whom the Western sanctions were aimed, only 27% indicated that they targeted the general population. This number, however, noticeably grew to 41% in September. At the same time, there were less Russian citizens who perceived the sanctions as a punishment against a narrow circle of Kremlin decision makers; a drop from 42% to 30%. This change in public sentiment may play out in two different ways: either more people will rally around the Kremlin’s aggressive foreign policy as a sign of unity, or, as they start to feel the effect of sanctions, they will become more reluctant to support the leadership’s aggressive policy towards its neighbour and the West. Only time will show. Disclaimer: Expressed opinions belong to the author and do not represent opinion of the government of the District of Columbia.